Although we must have noticing some sign of the change of the seasons, we usually spending our everyday life without being aware of it. But only at the season when trees shedding their leaves, we are expecting some dramatic change somehow. We enjoying going out to see red leaves and eat something seasonal. A day with a special event adds colors to our daily life, but we ask to ourselves that didn’t we let our everyday moments go without being aware of anything. Time flies really fast. We’d like to spend everyday life as a people who can be aware of the sign and enjoying it. 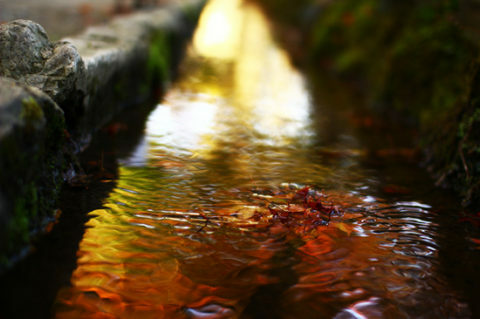 Photo: An artificial stream along the approach to the temple.